Mercedes is running “Soul”, a Super Bowl commercial starring Willem Dafoe, Usher and Kate Upton, introducing the CLA-Class. 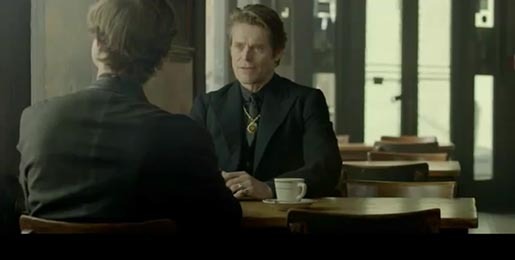 Dafoe appears in a New Orleans diner attempting to persuade a young man to sign over his soul in exchange for the new CLA-Class car advertised on the billboard across the road. The young man gets a glimpse of the glamorous life in store for him and is keen to do whatever it takes. The ad finishes with a fiery plot twist. The Soul campaign was developed at Merkley + Partners by executive creative director Andy Hirsch, creative group head Abi Aaron, creative group head Aaron Eiseman, senior producer Alex Kobak, director of broadcast production Gary Grossman, director of business affairs Pam Carden. Filming was shot by director Dante Ariola via MJZ with director of photography Philippe Le Sourd, line producer Natalie Hill, senior executive producer Scott Howard. Editors were Andrea MacArthur and Amanda Perry at Peep Show, New York. Visual effects were produced at The Mill, Los Angeles, by VFX Director Tim Davies, producer Rachael Trillo. Sound was mixed by Philip Loeb at Heard City.